Lubrication Engineers (http://www.LElubricants.com) introduces a new 100% synthetic engine oil to its line of fleet care products. 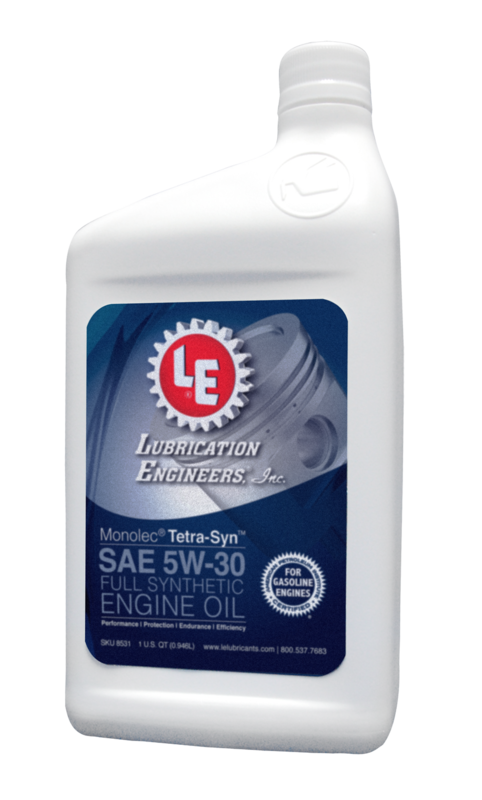 LE’s Monolec Tetra-Syn Engine Oil (SAE 5W-20 and 5W-30) outperforms most conventional motor oils, providing unparalleled benefits in performance, protection, endurance and efficiency. Its premium additive package provides fuel economy, protects emission systems, keeps engines clean and keeps deposits to a minimum. We formulated Monolec Tetra-Syn Engine Oil to provide the perfect balance of extended drain service, improved fuel economy, emission system protection and increased engine life. Lubrication Engineers, Inc. has harnessed the latest technology and knowledge to formulate a high-quality, high-performance, proprietary synthetic engine oil for gasoline engines. Monolec® Tetra-Syn™ Engine Oil – available in SAE 5W-20 and 5W-30 grades – provides robust protection for engines without sacrificing performance, endurance and efficiency. A 100 percent synthetic gasoline engine oil, LE’s Monolec Tetra-Syn Engine Oil (8521 and 8531) exceeds the minimum standards set by American Petroleum Institute. LE incorporated a premium additive package, including its proprietary Monolec® wear-reducing additive, to deliver fuel economy, protect emission systems, keep engines clean and keep deposits to a minimum. Monolec Tetra-Syn Engine Oil outperforms many commercially available passenger car engine oils and exceeds performance criteria of API and most OEMs. It exhibits low volatility and low viscosity shear characteristics and provides excellent low- and high-temperature performance. In extremely low temperatures, its flow characteristics ensure a continuous flow of oil. LE’s new oil protects gasoline engines for the long haul with its excellent wear reduction capability. It protects metal from rust and corrosion, provides superior oxidation protection, and prevents formation of ash and other deposits. It even provides protection from the higher temperatures found in engines with turbochargers and superchargers. Car enthusiasts and fleet managers alike will appreciate Monolec Tetra-Syn Engine Oil’s ability to keep engines running for longer periods while safely extending the time between oil changes. LE recommends the use of its LEAP oil analysis program to determine the optimum oil change intervals for specific vehicles or fleets. In many newer engines, Monolec Tetra-Syn will improve fuel economy. It will also lower emissions and protect emission systems per API standards. It exceeds the “Resource Conserving” guidelines for API SN engine oils and is suitable for use with ethanol-containing gasoline up to E85. Typical applications for Monolec Tetra-Syn Engine Oil include personal passenger cars, vans and light trucks, and vehicle fleets such as those used by municipalities and delivery companies. The oil offers exceptional performance suitable for use in most OEM gasoline engines, including Honda®, Ford®, GM®, Toyota®, Chrysler®, Nissan® and Hyundai®/Kia®. Owners should consult their manuals for details. Monolec Tetra-Syn Engine Oil meets or exeeds the performance requirements of API SN/SM/SL, ILSAC GF-5, and all preceding API and ILSAC gasoline categories. It also meets or exceeds GM 4718M, GM 6094M, and GM dexos1™ performance requirements. The 5W-20 grade of Monolec Tetra-Syn (8521) meets or exceeds Ford WSS-M2C945-A, and the 5W-30 grade (8531) meets or exceeds Ford WSS-M2C946-A. 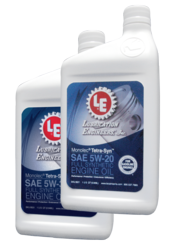 Call 800-537-7683 or visit http://www.LElubricants.com for more information about this and other LE products and services, or to find an LE consultant near you.